Welcome friends and wantoks from PNG and around the world! This is the unofficial home for the Miss Papua New Guinea Red Cross. This site is dedicated to all the beautiful young ladies who believed in themselves to make a difference in someone's life by taking part in the annual Miss PNG Red Cross Society Quest. 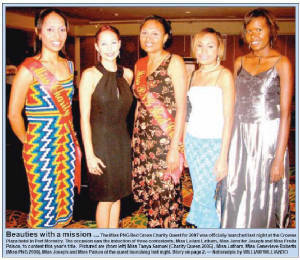 Firstly it is important to understand that the "Miss Papua New Guinea Red Cross Quest", is a major fundraising activity of the Papua New Guinea Red Cross Society. The Papua New Guinea Red Cross Society was incorporated by an Act of Parliament in March, 1976. This Act provided the Society with certain mandates to provide community and humanitarian services to people in great need of help after their normal lives have been affected by certain disasters. (iii) improvement of health, prevention of diseases, and mitigation of suffering. The tradition of 'Miss Red Cross' goes back more than 30 years. However the first time that the title of "Miss Papua New Guinea Red Cross" was used was in 1974, just prior to independence. At this time, the PNG Red Cross Society was offered the franchise for the winner of its annual Quest to represent Papua New Guinea and the Red Cross both overseas and at numerous functions at home. Miss Charity Queen is automatically the contestant who with her sponsor raises the most funds for the Red Cross. 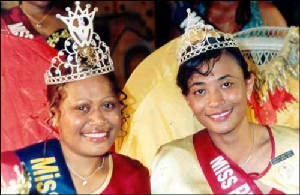 The judges do not know who Miss Charity Queen will be, so it is possible for the same contestant to win both titles. Miss PNG quest not only provides an opportunity for contestants and sponsors to help Red Cross, but also help many contestants to further their personal development and enhance their careers. This is particularly true of former Miss PNG Winners. In 1906, British New Guinea became Papua, and administration of the region was taken over by newly independent Australia. With the outbreak of WWI, Australian troops promptly secured the German headquarters at Rabaul, subsequently taking control of German New Guinea. In 1920, the League of Nations officially handed it over to Australia as a mandated territory. During WWII the northern islands and most of the northern coast fell to the Japanese who advanced southward until stalled by Allied forces. By 1945 the mainland and Bougainville had been recaptured, but the Japanese were impregnable in New Ireland and especially Rabaul in New Britain, where they dug 500km of tunnels. They surrendered these strongholds at the end of the war. Post-war, the eastern half of New Guinea reverted to Australia and became the Territory of Papua & New Guinea. Indonesia took control of Dutch New Guinea in 1963 (incorporating it into the Indonesian state as Irian Jaya). PNG was granted self-government in 1973, and full independence was achieved in 1975. Papua New Guinea's most immediate concern after independence was its relations with powerful neighbour Indonesia. After Indonesia's takeover of Irian Jaya, many West Papuans organised a guerrilla resistance movement - Organisasi Papua Merdeka (OPM) - which fought Indonesian forces with limited success. Tensions decreased markedly after 1985, as the flow of refugees (estimated at over 10,000) between Irian Jaya (now called West Papua) and PNG slowed. There are still 7500 West Papuan refugees living in camps in Western Province - the largest expatriate group in the country.